The Illusion Extinguisher Deer Call is truly in a class of its own. At first glance, it might look a bit intimidating, or at least a bit unique—but many are calling this the best deer call ever. At a $20-$30 price range, this is one of the more expensive calls out there, but certainly doesn’t break the bank. It’s not even a major investment for novice hunters. Has a 99.6% approval rating from the North American Hunting Club. Authentic tone, pitch, and range for the whitetail deer. Allows you to effortlessly transition from fawn, doe, and buck call—making it sound like you are one of multiple deer in a herd. Speaks a full range of whitetail deer grunts, snorts, wheezing, and bleats. 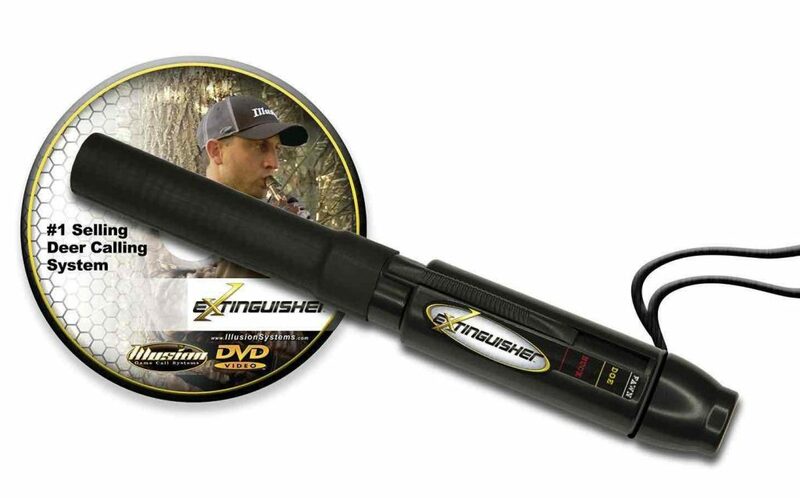 Instructional DVD teaches you how to master a diverse range of calls. Has freeze-free technology built-in for cold weather hunting. Built-in lanyard for easy access. Why Buy The Illusion Extinguisher Deer Call? As you know, a lot of calls make similar claims as the ones above—but how many can back their claims with a 99.6% NAHC rating? None to date! This call is easy enough for novice hunters to master (after watching the DVD of course) but effective enough for tenured hunters to be wildly impressed. It’s about 7 inches long, but is lightweight—and can be worn around your neck on the attached lanyard. The fact of the matter is, every game call works a bit differently. Even with written instructions, you may not get it quite right. With the diverse range of calls offered by the Illusion Extinguisher Deer Call, you simply must have a video tutorial. Even tenured hunters need to invest the 40 minutes watching this video and perfecting its calls. No more carrying multiple deer calls. Simply move the slide to transition in-between fawn, doe, and buck. Watch the DVD to learn the various range of grunts, snorts, wheezing, and bleats required for successful hunting. One of the biggest drawbacks of even some of the more popular calls is that they don’t sound quite right. We find the tone and pitch to be indistinguishable from a real live whitetail. You are sure to have found some impressive whitetail deer calls in the past, but they didn’t have the range you needed to attract attention from a distance. This call does! Many calls work great, until the reed becomes misaligned. If you don’t get it back in place, it might never sound quite the same. However, Illusion Extinguisher easily snaps back in place with expert precision. Bow hunters are sometimes hesitant to give gaming calls a try because it’s a piece of gear that takes a bit of time to master. However, this call is designed to be as easy as possible. The attached lanyard makes it easy for you to call, without getting in the way of your bow and arrow. This call is designed to stand the test of time. It holds up in subzero temperatures without freezing or impeding the tone or pitch. While some calls crack, break, or malfunction after just one seasons—this durable call will be part of your essential gear for years to come. The Illusion Extinguisher might be a bit larger than most calls on the market, but it is the only call you will ever need. Without watching the DVD, you may not be impressed—so take the time to sit down and watch it from start to finish. Maybe even watch it a second time after your first time out hunting. If you are looking for an authentic, effective, and durable deer call—this is the call for you. While it’s two or three times the cost of other popular calls, at its price range, it is an investment that will pay itself back tenfold.